One of the most famous cities in Florida, Miami is instantly recognizable with its stunning skyline, world-famous port, and perfect beaches. It's one of the top tourist locations in all of the US and with good reason, as Miami enjoys almost constant sunshine and has a lot to offer every visitor. With the Atlantic Ocean right nearby and the city’s warm waters attracting all sorts of marine life, Miami is a thriving fishing hub. South Pointe Park Pier - A popular spot for tourists and residents to simply walk around, South Pointe Park Pier can be found at the end of South Beach. It's a great fishing spot for Spanish mackerel, red snapper, and more. 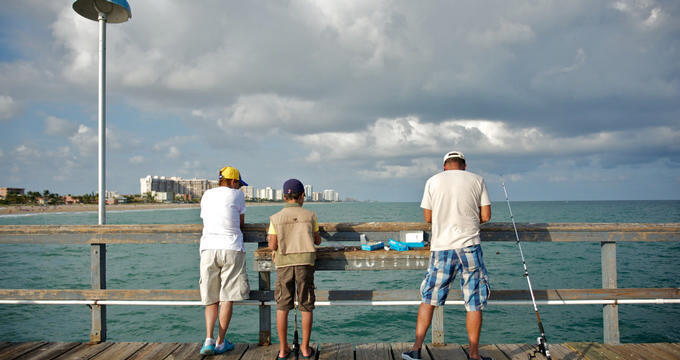 Newport Fishing Pier - Found at Sunny Isles Beach, this is one of Miami's other major fishing piers. It stretches out approximately half a mile into the Atlantic Ocean and is the best spot for people who want to have a chance of catching some offshore species without actually heading out on a boat. Oleta River State Park - Also in the Sunny Isles Beach area, the Oleta River State Park features its own fishing pier with a good chance of reeling in some pompano, red drum, and several other species. The park itself is also a really picturesque spot and can be very enjoyable to simply walk around. If you’re in search of the biggest fish and want to enjoy a full day of reeling in the likes of permit, tarpon, tuna, grouper, amberjack, mahi-mahi, marlin, and more, you’ll want to reserve your spot on one of Miami’s many fishing charters. These boats offer both deep sea and flats fishing expeditions and are led by trained captains and crews who know the waters of Miami better than anyone else and can give you a great chance of reeling in a big one. One of the most experienced and professional fishing charter operations in all of Miami, Miss Britt runs several different charter tours in search of sailfish, mahi-mahi, grouper, snapper, swordfish, and many more species. Renowned for the friendly, welcoming attitudes of its captain and crew, Miss Britt really is one of the top names when it comes to fishing in Miami. These fishing charters have earned nothing but rave reviews and have even been featured on several TV shows. The Outcast measures up at 42 foot long and offers saltwater fishing tours with main targets including mahi-mahi, wahoo, sailfish, marlin, kingfish, amberjack, shark, and many others. You never know quite what you'll find when heading out on 4-8 hour fishing charter expedition with Outcast, but you're guaranteed to have a great time on these highly rated tours. Regarded as one of the best fishing charter operators in all of Miami, the Top Gun sets out on the waters of Miami and Key Biscayne in search of sailfish, mahi-mahi, grouper, snapper, tuna, cobia, and more. The vessel itself is speedy and comfortable, with all the amenities and top class tracking equipment needed to ensure that every passenger has a great time, and the Top Gun has enjoyed some really big catches in recent years.